March | 2016 | The British in Crete, 1896 to 1913. On 7th March 1897 a force consisting of 200 British sailorts and Marines, 100 French , 100 Austrian and 75 Russians, was landed on the south west coast of Crete. 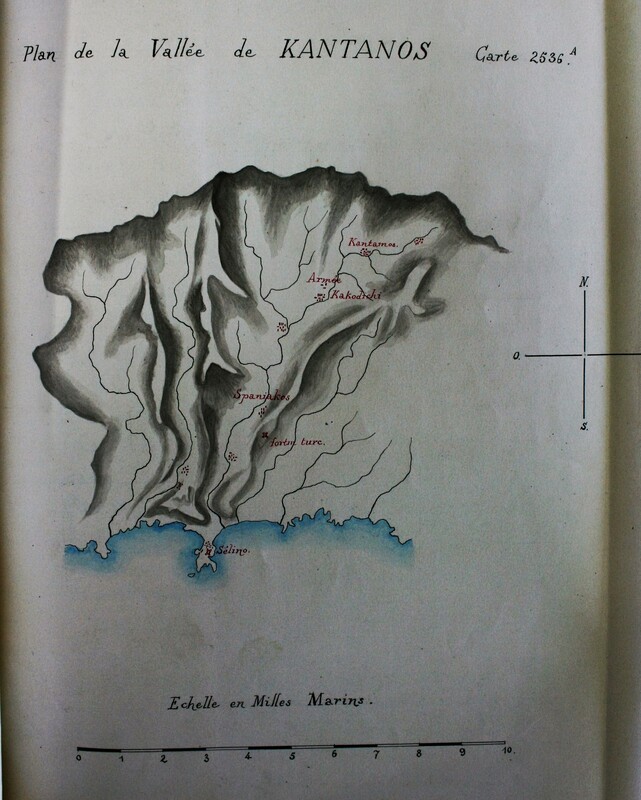 Accompanied by Sir Alfred Biliotti, the British Consul, their task was to evacuate some 1600 Cretan Muslims and 450 Ottoman soldiers from the village of Kandanos in south west Crete, then under siege by Christian Cretans supported by Greek manned artillery. (It should be noted that the actual dates on which the events in the evacuation occurred are somewhat difficult to determine. The main source of information is Sir Alfred Biliotti who although he was present throughout, was less than clear in his dispatches; particularly when it came to putting dates in his narrative! The dates given here was obtained from various accounts, including the log of H. M. S. Rodney; in deference to the log keeping traditions of the Royal Navy, these dates are preferred to those given by Biliotti. Similarly, the numbers of evacuees varies from account to account.) The base for the operation was the then semi-derelict village Selino Kastelli, modern Paleochora. 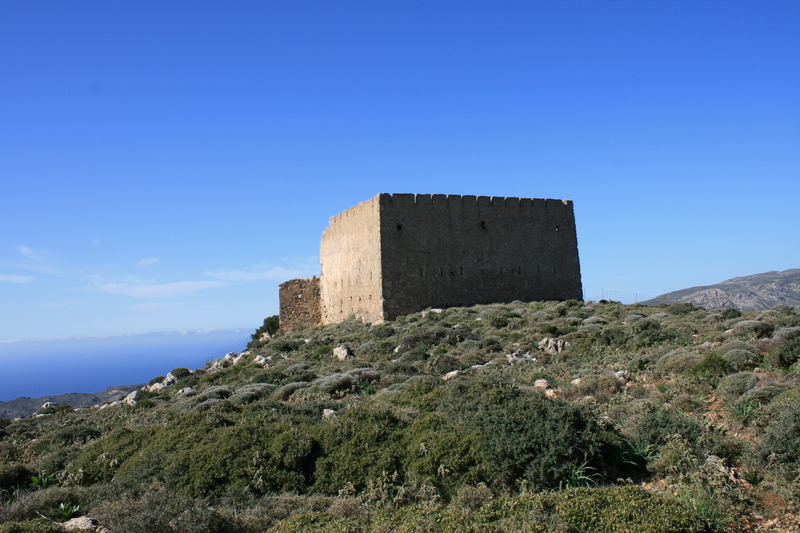 En-route to Kandanos the European troops stopped overnight in the hamlet of Spaniakos and evacuated the garrison from the Ottoman fortress above the village. The French troops are reported as having spent the night in a local notable’s harem; the British in the local mosque. British sailors leading column of refugees from Kandanos. Illustration by Melton-Prior. For the most part the evacuation went without difficulty and the refugees arrived in Canea aboard the various European vessels. Some would stay in Canea, some went to the Turkish mainland, but few ever returned to Kandanos, and those who did were uprooted again in the 1923 population exchange. 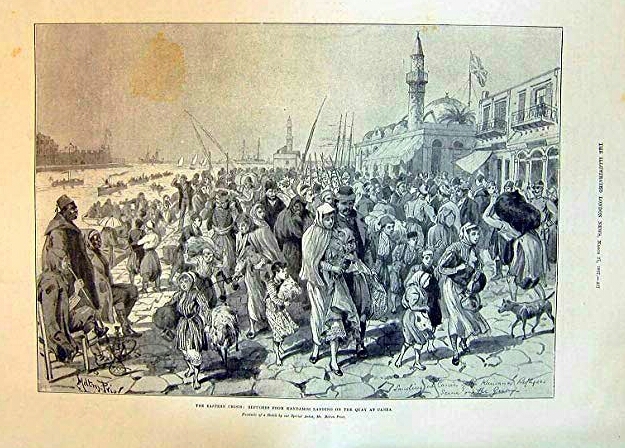 Cretan Muslim refugees from Kandanos arriving in Canea. March 1897. However, in the final stages, when the column reached the sea at Selino Kastelli, Cretan insurrectionists opened fire on the International troops. Given the overwhelming superiority in fire-power of the European forces, not to mention the presence of a considerable number of European warships in the immediate vicinity, it’s not difficult to predict the outcome of the engagement. 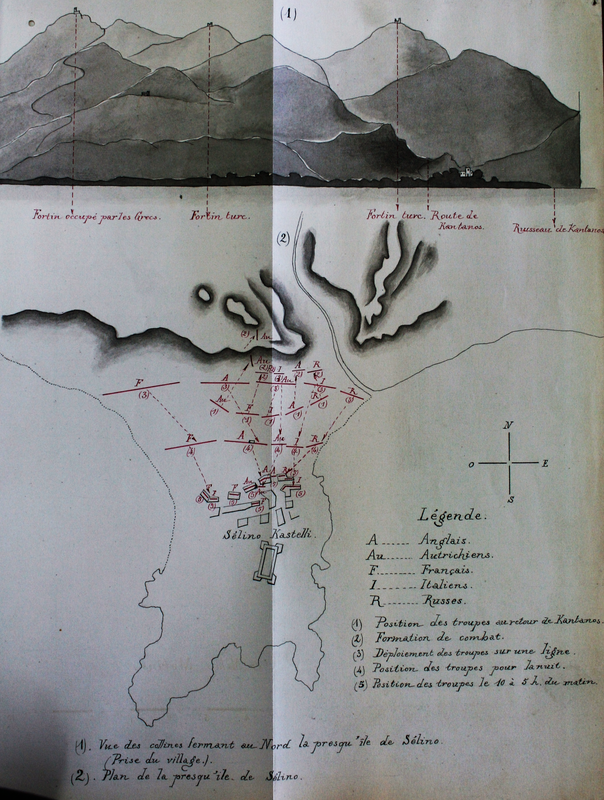 During the operation several maps and sketches of the area were produced, apparently by French naval officers. Area of Operations. 5th to 10th March 1897.
International troops landed at Selino Kastelli and then proceed to Kandanos via Spaniakos and Kakodiki. 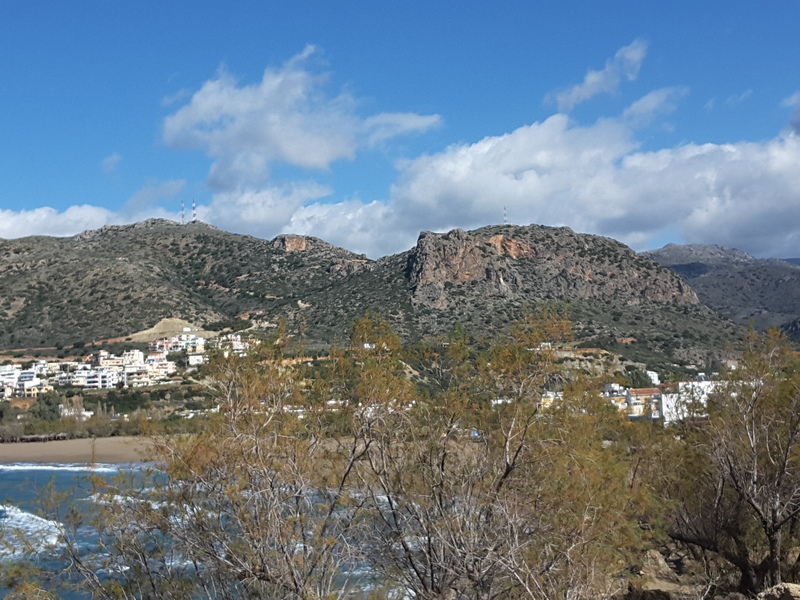 View of the hills above Selino Kastelli and the disposition of International troops on their return from Kandanos. 10th March 1897. The outline of the hills above the village appears to suggest that the sketch was made from a viewpoint in the south west bay. Hills above Paleochora, February 2016. The route to Kandanos and Spaniakos is through the valley on the right hand side of the photograph. Evidence of the use of Gras rifles, the type used by the Cretan insurgents, has been found near the site of the final encounter. 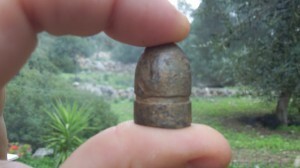 Gras bullet found in Paleochora near the site of the engagement. More details of the bullet can be found here. 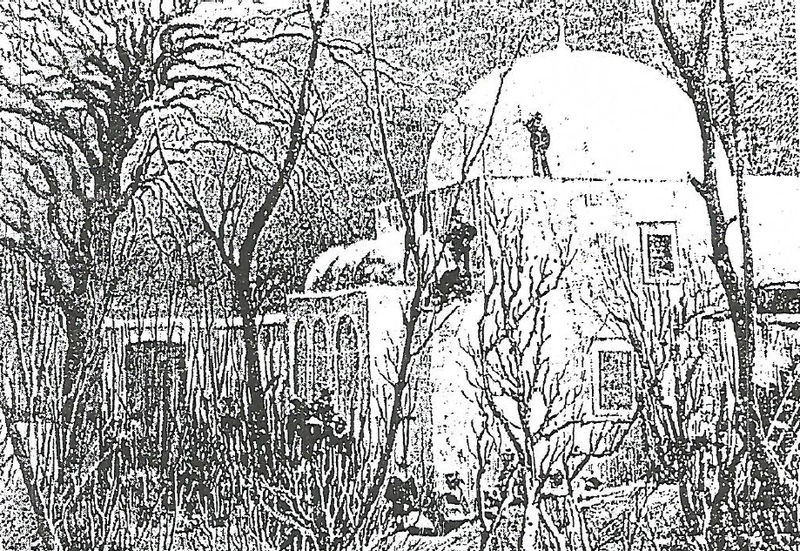 Many thanks to Bob Tait for supplying the illustration of the Spaniakos mosque. This entry was posted in Cretan Rebels, European Intervention Crete, Royal Navy in Crete and tagged Cretan Muslim refugees 1897, Crete 1897, European Intervention Crete, H.M.S. Rodney, Kandanos, Kandanos 1897, Paleochora, Selinos -Kastelli, Sir Alfred Biliotti, Spaniakos on March 10, 2016 by Mick McT.